Since we are pushing our kids and our next generation to save, might as well develop close to a 52 week’s money challenge for them. And yes even the little ones can be able to do this provided with the support of their dear parents. The only difference with regards to the kids is to only lessen the amount. You can try with 1 peso a week and increment it with another 1 peso every week. By the end of the challenge, your kid would be able to save up 1,378. Not a huge amount though but nonetheless it is a good starting point for them to save. It is very important to let the kids know the importance of savings. Though we have that notion that they might not seem to understand but they can be able to grasp the concept of it. Thus, give time to explain to them why they should do such. Make sure you talk about it in a positive way. When your kids are doing the challenge, make sure that they would be the one putting the money on a weekly basis. Never do the savings for them. The least you can do is giving them the money but let them put it in the challenge jar or in the piggy bank. Do not spoil your kid too much by just giving them money. Make sure they also earn it as well. Give them household chores to do. When they are done, give them a little money that they can deposit for the challenge. As early as their age, they need to realize that money doesn’t grow from trees. It requires hard work in order to have it. Kids need positive reinforcement from time to time. That is why, if they were able to religiously deposit for four weeks straight and comply with the challenge, reward them to a movie or something they would love to do. Give them a bigger one when they finish the challenge. It is our responsibility to instill money discipline to our kids. As such it is imperative that even at a very young age, we engage them with this activity. So that when they grow, they would be able to develop that habit of savings and they would thank you for it. P.S. 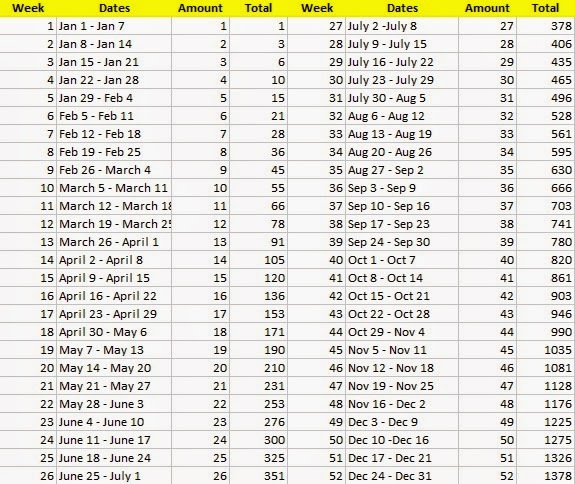 To those doing the 52 Week Money Challenge and 52 Week Money Challenge Version 2, it is Week 17 already! Did you deposit the next amount yet?